I am always up to try a new challenge. The other day I was talking to a Co-worker who has been going to this Orange Theory fitness place for a couple of weeks and she was telling me about the workout and I just had to try it out. This program is considered to be a heart rate monitored high intensity interval workout. There are 3 parts to the workout. It doesn’t matter the order it just depends where you chose to start. 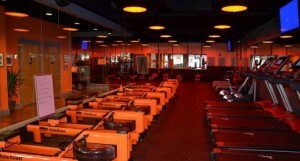 The 3 sections are Treadmill training, Indoor rowing, and weight training blocks. Once you arrive, they will attach a heart rate monitor band to your chest. 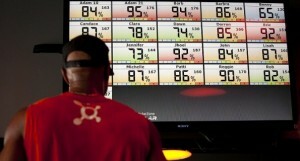 Your name will be on a screen so that you can monitor your heart rate zones. The goal is to reach into the orange zone which will allow for maximum fat burning! I started on the treadmill and noticed that my heart rate was way higher than the others so I panicked and slowed down. They have a trainer there guiding you through the whole time. You have periods where you sprint, run hills, etc…needless to say I was exhausted but did hit the zone on the treadmill! Next was the indoor rowing. Our goal was to reach some number of 150, but I have no clue yet what that meant. I only made it to 90! I did notice my heart rate was getting lower during this time. I am thinking that maybe mentally I was giving myself a break. The final part was the strength training. We did all this crazy hard stuff! We even used the bands that were attached to the walls. (TRX) I was dying on the inside because I was probably the weakest one there. The workout lasted an hour. Once you finished, you go to a screen and it tells you how many calories you burned and your heart rate during the session. I am glad that I went. The place is in South Tampa so I am sure I won’t be driving there much to go but it was a nice change and a killer workout. I did some searching and discovered that Brandon will soon have a location! So maybe I can go a tad bit soon. If your into working out and like to try new things, this one is a must. I would recommend bringing a towel because you will sweat. I never sweat but I did here. This program is also beneficial to runners because the treadmill workout is like a speed workout. I need that! There are only 25 more school days left so I am looking forward to getting into better fitness and healthy living this summer! It is always more fun working out with someone! Set a date and a time and get started! It seems that when you have something scheduled with someone, your more likely to reach your goal. The bible talks about encouraging one another and building each other up. Working out with others does just that! Here is a link to the place if you would like to check it out!